hello friends! 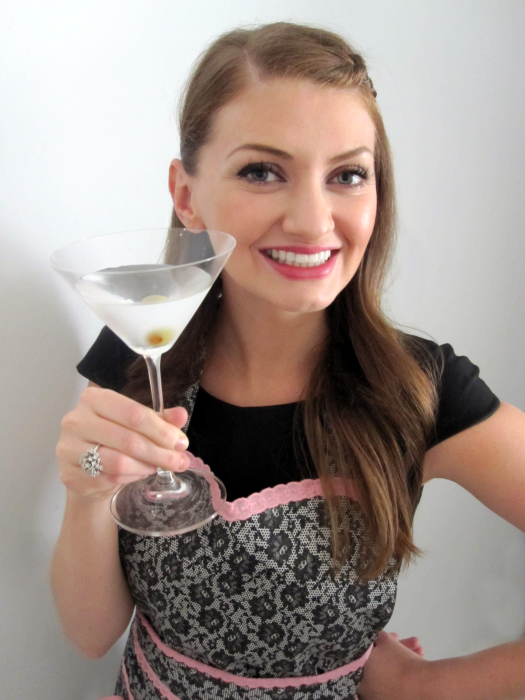 welcome to my latest installment of what i brought to the Let’s Bring on Fall party! you already know that sweets-wise, i brought the amazingly delicious pumpkin cupcakes with salted caramel buttercream. what did i bring savory-wise? after looking through recipes, i opted for this herbed yukon gold + sweet potato gratin with gruyere + i’m oh-so-happy i did. i’m not always the hugest fan of casseroley-type dishes, but due to the awesome fresh herb blend + the delicious gruyere, i decided to give it a try. the results? one of the best potato dishes i’ve ever eaten. and yes, it was the first savory dish to go at the party – people loved it! the combination of the types of potatoes with all the fresh herbs + the amazingly tasty gruyere cheese is just wonderful. the potatoes get a creamy texture + great flavor while retaining a perfect bite. a few notes — it says to cook it until most of the liquid is absorbed. i found that cooking it until about 60% of the liquid has cooked off worked well – in the 15 minutes that you let it rest, the remaining liquid is quickly absorbed into the potatoes. also, make sure you dry your potatoes well after removing them from the water – excess water could alter the consistency of your gratin. this gratin takes a little prep time, what with the slicing of the potatoes, but it’s completely worth it. enjoy! fill a large bowl with cold water. working with 1 yukon gold potato at a time, peel, then cut into 1/8”-thick rounds + place in bowl with water. repeat with sweet potatoes. set bowl aside. combine cream, butter, + garlic in medium saucepan; bring to simmer. remove from heat. mix all herbs in small bowl. mix sea salt + black pepper in another small bowl. butter a 13 x 9” glass baking dish. drain potatoes from water, then thoroughly dry with kitchen towels. transfer half of potatoes to prepared baking dish. use hands to distribute + spread evenly. sprinkle with half of salt-pepper mixture, then half of herb mixture. sprinkle with half of cheese. repeat with remaining potatoes, salt-pepper mixture, herb mixture, + cheese. preheat oven to 400°F. cover gratin tightly with foil. bake 30 minutes, then uncover + bake until top of gratin is golden + most of liquid is absorbed, about 30 minutes longer. let stand 10-15 minutes; serve. oh yum! Love this one! Seriously, this dish should be a *mandatory* addition to all thanksgiving day menus everywhere. my family often has sweet potatoes and mashed potatoes, — which is too much plate real estate to dedicate to root veggies on a day with so many options. this dish can replace both with ease and every last morsel will be devoured, all while still leaving space in one’s belly for more turkey+veggies. and it goes without saying that i’d like to see this dish any day of the year with roast pork or chicken. ha! thanks for popping in, hungry husband. you really brought a lot of dude into the comments, what with your thoughts on ‘plate real estate’ + maximizing belly room for turkey. you make me laugh! amen! this is serious curl-up-on-a-cool-evening comfort food, which is arguably one of the reasons i love fall so much – cozy comfort food! I’m going to second hungry husband here. Great idea – looks and sounds delicious! OMG drool! I love the combination of the regular and sweet potatoes with fresh herbs…and cheese! Sign me up! I’m pretty sure this dish is going to make it on my list as a side for Thanksgiving this year. Thanks for sharing! this is definitely thanksgiving-friendly, actually, that’s essentially the meal we had at the Bring On Fall party, with roasted turkey. this was a perfect complement to the turkey + the other fixins! This definitely looks like a great fall dish. I like the idea of serving it on Thanksgiving! Love your husband’s comments! yeah, you can’t go wrong with those ingredients in my book, either. especially the cheese. and butter. and cream! I love gratin! It’s so yummy! I will have to try it mixed with the yukon and sweet potatoes! thanks, lesley – i think you’d love it, as i know you love a good cheese. the cheese + herb flavors just come through wonderfully. Absolutely amazing! This may become my next “go-to” Christmas dinner potato dish. Can’t wait to try it out!!! that would be great! i can’t wait to hear how it turns out for you! Oh my word, that’s the best looking pyrex of carbs I’ve ever seen. And I love the addition of sweet potatoes. NOw I won’t feel so guilty devouring a second serving. Yummy! ha! your comments always make me giggle. =) the sweet potatoes don’t just add a little health, they also add some purty color + a nice flavor change, too. this is definitely my new favorite ‘tato dish! what a sweet story, chris. it sounds like i can tell where you got your foodie skills from! =) you should definitely surprise your dad with a hearty meal with this side dish one day – i’m sure he’d be incredibly touched! Amy this looks sooooooooooooooo yummy. I’m putting it on my list of dishes of yours I need to try! Wow. I love how this dish looks. I LOVE potatoes and I’m about 99% sure that this will be on my Thanksgiving table this year. Thanks for sharing! that’s great to hear! i think it’s going to be on our thanksgiving table this year, too (+ our christmas table, too, if my husband gets his wish)! can’t wait to hear what you tihnk of it! Everything you bake always looks so delicious! I’m not a huge fan of baked sweet potatoes, but I do like a taste or two. This is the perfect medley to make everyone happy for the upcoming holidays. thank you so much leandra! i’ve been working on making my food look prettier. =) if you don’t like sweet potatoes, you can definitely use all yukon golds instead. or a mix of, say, yukon golds + purple potatoes. or yukons + russets. play around + i’m sure you’ll find the perfect recipe for your preferences! Wow this sounds fabulous! This would be a perfect addition to our Thanksgiving dinner this year, thanks! What a great recipe! 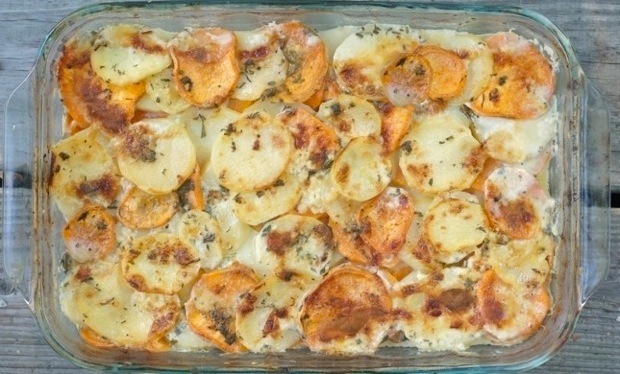 All the herbs and cheese with the potatoes – I am sure this is delicious! it is! everything works perfectly together + the flavors are just delicious.